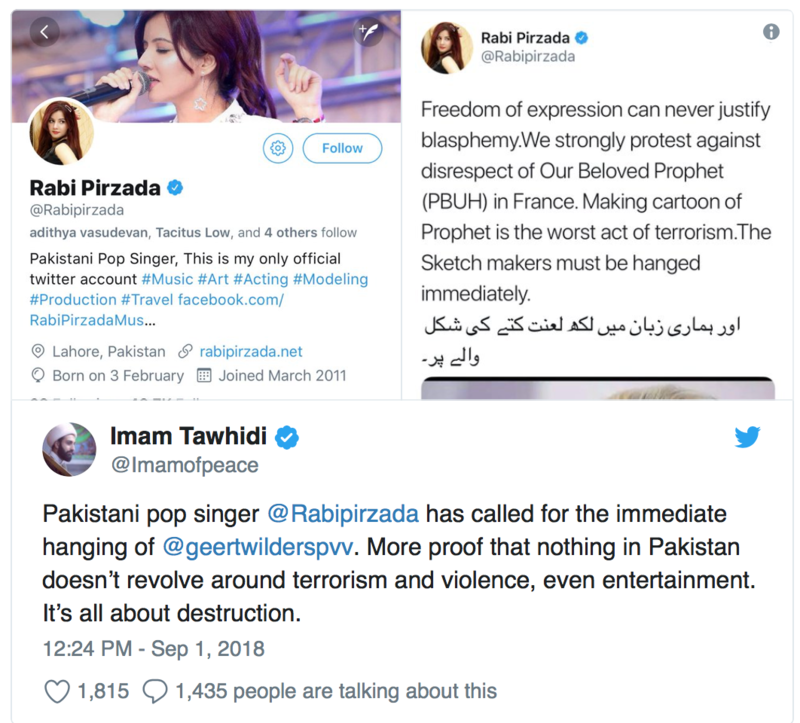 Pakistani pop star Rabi Pirzada has used her verified Twitter account to call for cartoonists who draw the Prophet Mohammed to be “hanged immediately”, claiming that drawing Islam’s founder is “the worst act of terrorism”.“Freedom of expression can never justify blasphemy,” railed the singer — outwardly very Western in appearance, wearing modern clothing and leaving her hair uncovered.“We strongly protest against disrespect of Our Beloved Prophet (PBUH) in France. Making cartoon of Prophet is the worst act of terrorism. 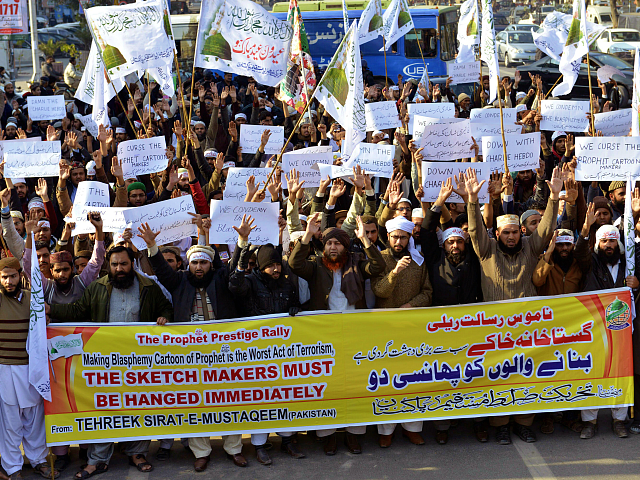 The Sketch makers must be hanged immediately,” she demanded. Muslim “extremists”. Are there any other ones? …as long as its got nothing to do with Islam…. 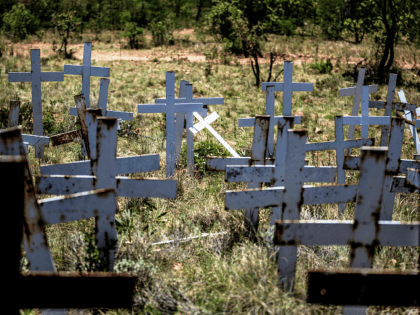 Anything to distract from the real problems…. Interesting how quick they circle the wagons. Its not just a coverup, they’re all complicit. Otherwise they wouldn’t behave like that. 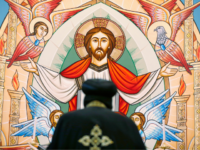 Such gestures have become symbolically important in the West since a gang of radical Islamic terrorists slaughtered staffers at the satirical Charlie Hebdo magazine in their Paris offices in 2015 — although few take the risk of making them. The Pakistani senate passed a resolution calling on the government to press for global ban on blasphemy at the United Nations in response to the competition, while Pakistani cricket star Khalid Latif offered a $28,000 reward to “kill the Dutchmen” involved. 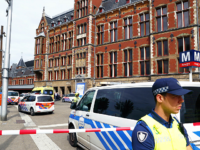 This culminated in Dutch police arresting a 26-year-old Pakistani national, claiming he had made threats against Wilders and the Dutch parliament. 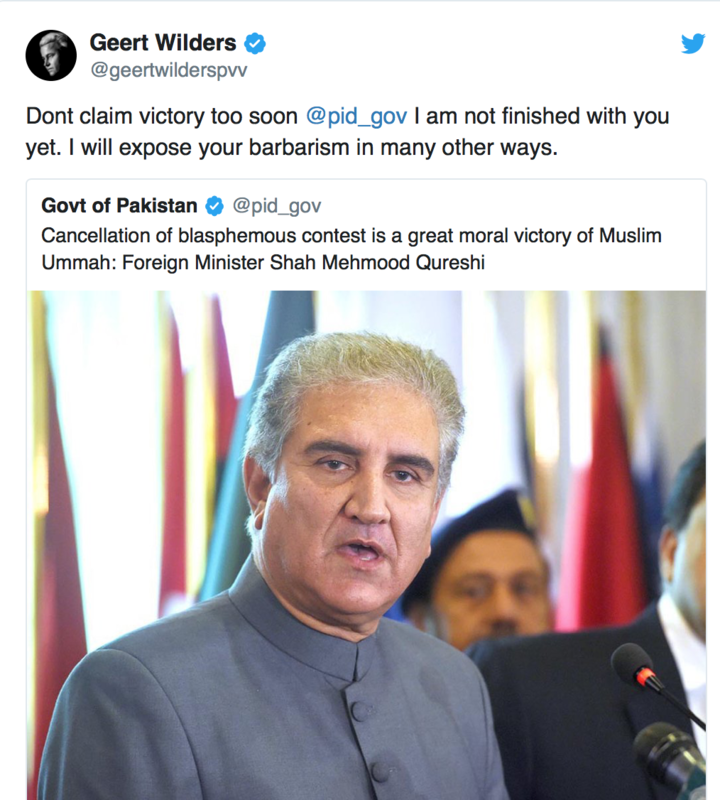 Unperturbed, the Pakistani government hailed the contest’s derailment as a triumph, tweeting: “Cancellation of blasphemous contest is a great moral victory of Muslim Ummah”. 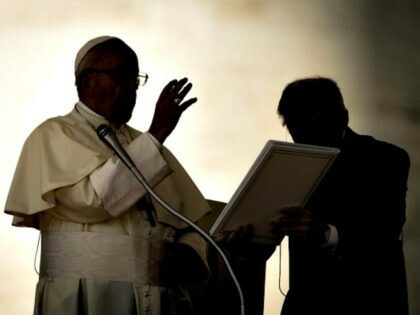 Previous PostNo, we will not always have ParisNext Post“Far-Right” – WTF does that even mean? That PakiBitch is a Turd, not a Tard! Isdamnic terrorism maims and kills innocent people. Cartoons are harmless. Muslims belong to and in Hell. Shrub should have punched their tickets 17 years ago! Now Al Dajjal that is not fair to turds. A turd is an environmentally positive emission and a happy carbon package for the Globull Warmists. Who will rid us of this troublesome Rabid Piranha? !